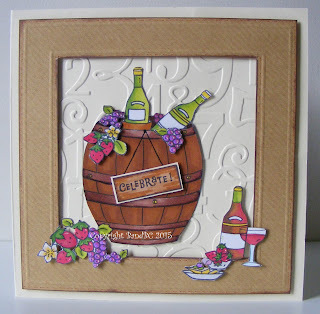 This lovely image is called "wine barrel" and its from My heart pieces at Stitchy Bear Stamps. barrel, bottles, booze (! ), berries, brown, border. But I think this one's a card for a male. I coloured the image with my promarkers and popped some parts on foam pads. I decoupaged the fruit at the top of the barrel. but I have faux-stitched around all the edges of the frame, too. and used that inside the frame, as a background. onto the wine bottle labels. Brilliant card for the theme! I love the beautiful image & your bang on design! Fun card, Vic, and you certainly pile on the "b"s. :-D Love all that cutting you did. Great idea for a celebratory card. Thank you for your entry into our anything goes challenge at Love To Scrap. Great card! Love the way you cut the images! Thanks for joining us at Kraftin Kimmie WW challenge. A great make for anyone who likes wine! Awesome cutting skils as well - you're so neat. Fabulous 'Blokey' card :-) Great colouring. I love the fact that you have used texture instead of patterned paper for our challenge.